Fourth Edition of CryptoTuesday Brings 6 New Additions to Ledger’s Application List. 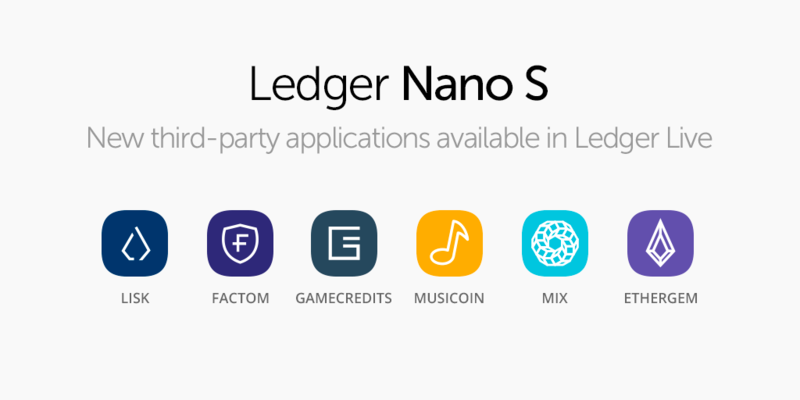 Ledger welcomes Lisk, Factom, MIX Blockchain, Musicoin, GameCredits and EtherGem to the Ledger Nano S. Equally, the last four mentioned will be compatible with the Ledger Blue. These six applications have been developed by the respective communities, bringing the number of third-party developed apps to 32 since the start of the year. Following IOTA last friday, six new crypto assets are now available for the Ledger Nano S as well. CryptoTuesday is an initiative Ledger has started in August. We welcome Lisk, Factom, MIX Blockchain, Musicoin, GameCredits and EtherGem today to our applications list. These six cryptocurrencies will be compatible with their respective wallet applications, which can be found on our FAQ and our coverage page. Ledger Live will gradually incorporate full support for third-party applications, to enable Ledger users to not only install, but also manage these new crypto assets directly from Ledger Live. As of today, a total of 27 crypto assets have joined the Ledger Live application manager thanks to CryptoTuesday, adding to the 700+ cryptocurrencies already supported by Ledger. This included high ranking cryptocurrencies in terms of market capitalization, such as EOS (5th*), VeChain (20th*) and Ontology (27th*). CryptoTuesday is celebrated each first Tuesday of the month. For this event, we review applications compatible with our devices created by the communities of respective cryptocurrencies and publish them. We are incredibly grateful and humbled to have such active, engaged communities and enabled this monthly rendez-vous to honor that. Naturally, there are certain requirements and procedures for these submissions, which can be found on this page. Plans for upcoming application releases can be found on our Ledger overview: Internal and External developments page.